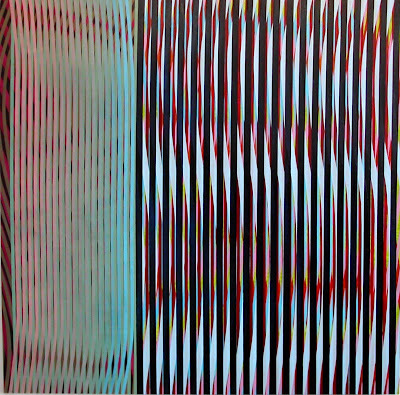 Figure 3.2 Dickens, Blue Caribbean Vibration, Moiré series, 2003, oil on canvas, 152 × 152 cm. 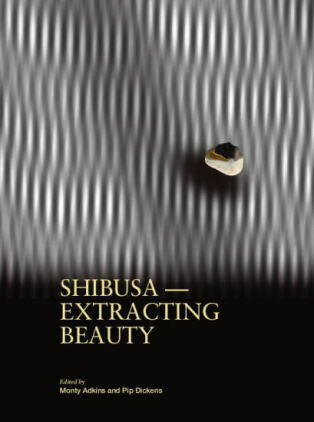 patterning a variety of substrates, including kimono fabric, has recently found itself an object of desire in the West. Collectors,including myself, are attracted by its many startling qualities: intricate, delicate and complex designs, many of which convey optically vibrant arrangements. Given the use of the stencils in busy textile workshops, where dyes and resist materials are pressed through them again and again, it is not surprising that few of them survive in good condition today. However, whatever the aesthetic or design quality of the stencil, its most valuable asset is the evidence it provides of the virtuosity of the craftsperson – the hand skills of the artisan. The Leverhulme Trust Award collaboration with Monty Adkins has used the katagami stencil as a symbol of how we can best investigate the synergy between music and painting. By drawing on the stencil’s qualities (and that of the stencil’s maker), themes emerged that directed us towards specific approaches in developing new works and the elements contained in those works. It is important to emphasise how the stencil has developed a symbolic role (and why I have linked it directly to Richard Sennett’s writing on craftsmanship) because elements of the stencil’s aesthetic properties have also been absorbed and explored within preliminary works. The stencil, therefore, has played two distinct roles in this project: an important visual reference, and a symbol of good making skills. through experimentation (trial and error) or through the action of painting where a skill of rhythmic control may be called into play. The same is true of musical performance and composition. 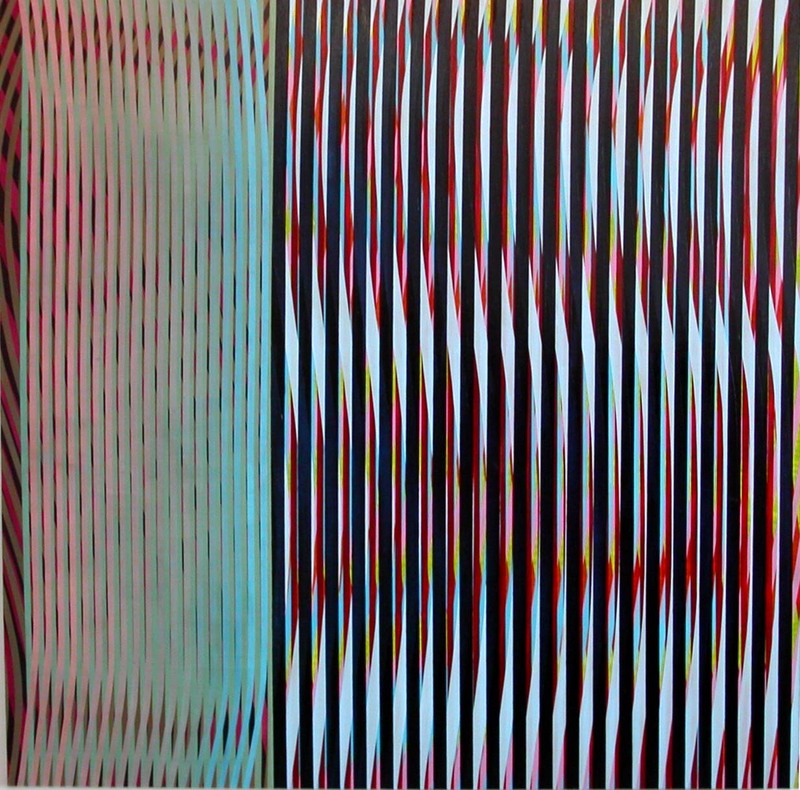 In this chapter I introduce three series of visual artworks: my own Moiré series, paintings by Bridget Riley and photo-booth collages by Liz Rideal. All these works evidence these skills consciously, without relegating repetition to the banality of design or ‘wallpaper’. Rather, these are highly original approaches due to the physical engagement of the artist through innovation; the skill of repetition and rehearsal; and the ‘X’ factor which, ultimately, is the role that an artwork plays while in production: the work creates a ‘dialogue’, or response to, actions imposed upon it during its development. Each of these artists demonstrates a very distinct and individual approach to pattern, rhythm, vibration and colour. Moreover, each evidences different levels of use of technology and hand skills. [End of Extract] This Chapter then goes on to review the works of Pip Dickens, Bridget Riley and Liz Rideal in depth.